Barcelona striker Luis Suarez gave his team the lead in their El Clasico clash with Real Madrid after a brilliant run and assist by Ousmane Dembele. 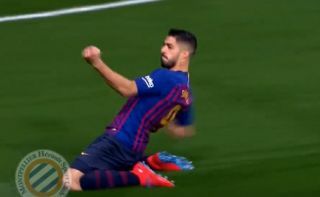 Watch the goal video below as Suarez pokes in an instinctive finish inside the box to make it 1-0 in tonight’s Copa del Rey semi-final second leg clash. Though the Uruguay international has looked slightly past his peak this season, he remains a real threat in the penalty area and showed it here. Barca will now be hoping they’re heading into the final after going 2-1 up on aggregate after a 1-1 draw in the first game at the Nou Camp.